When I saw a recipe for chocolate truffles in a Ghirardelli ad a few years back, I couldn’t believe how very few steps were involved. I love chocolate, especially dark, so I tried it. Very easy, indeed. Melt some chocolate chips with butter and cream, refrigerate for 2 hours, shape the truffles, roll them in cocoa and voilá: handmade, soft and creamy, bittersweet delights to die for. A couple of months ago I had a craving for chocolate and chili peppers, a combination that I have tried and enjoyed before. I doubted I could find a chocolate bar with chilies in my local grocery so I thought I might be able to make it myself using that basic truffle recipe I had. Cayenne was going to give the bite, but I felt like I needed a richer flavor. Another truffle recipe suggested orange peels. Cinnamon is also often found in this Mexican style chocolate but I was looking for something less ubiquitous and overpowering. I have been experimenting with cardamom lately and it felt just right for this. Well, that should do it. And it did it, in fact. Rich dark chocolate with a perfect balance of spice, sweet fragrance and citrus tang. A pure indulgence in a few very simple steps. In a small saucepan bring the cream to a simmer. Add the butter and stir until melted. Add the chocolate chips. Stir until completely melted and smooth. Stir in cayenne, cardamom, orange peels and salt. Remove from the heat and pour into a shallow bowl. Cool, cover and refrigerate until firm, at least 2 hours. Using a melon baller or small spoon, roll mixture into 1-inch balls. 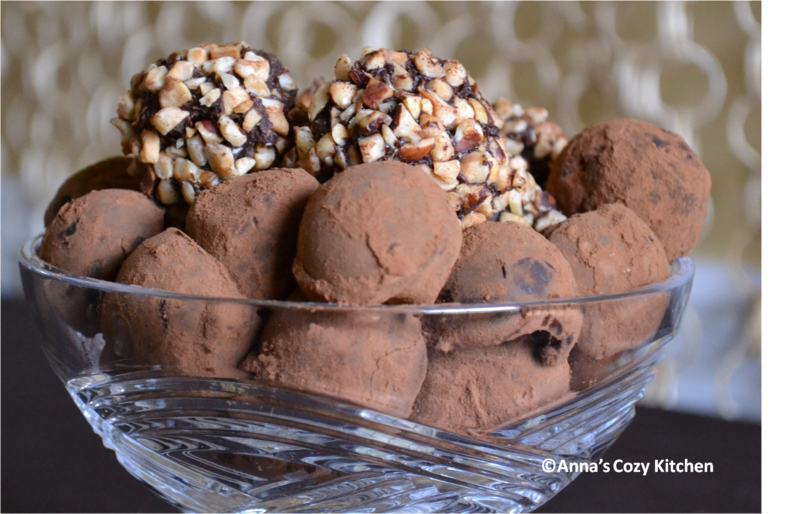 Roll each ball in cocoa or nuts. Enjoy! The truffles are best kept refrigerated in an air tight container. This is what I am making for Valentine’s Day. What about you? This entry was posted in Holidays, Sweets and tagged Cardamom, Cayenne, Chocolate, Chocolate Truffles, Mexican Chocolate, Orange Peel, Recipe, Spicy, Valentine's Day. Bookmark the permalink. I can’t wait to try these. The combination reminds me of Abuelita, the Mexican chocolate drink. I know of some people who are interested in including a similar spice and chocolate combination in beer. Hmmm spicy chocolate beer. Sounds like something you may be able to find in Belgium. Your friends better hurry up. I’m more of a fan of spice than the sweeter overtones in Abuelita – but I totally agree, the cinnamon in Abuelita could be really nice. Holy cow these look and sound sooooooo good. Why didn’t you make these when I sat right next to you??? Ha-ha. You are funny. I just came up with this version recently. It is so much better than the original :). When are you visiting next? I love the combination of cayenne y chocolate – que delicioso ! I must confess that i have had quite a few of those spicy deliciiiooouuussssss truffles myself. They are excellent, and even better if you pair them with rum, then you just have the best Saint Valentine Desert item. I can’t think of many things that can possibly beat it. It’s snowing on this blog. I think I was the first person to notice this.